Ever fancied restaurant quality meals in your own home? 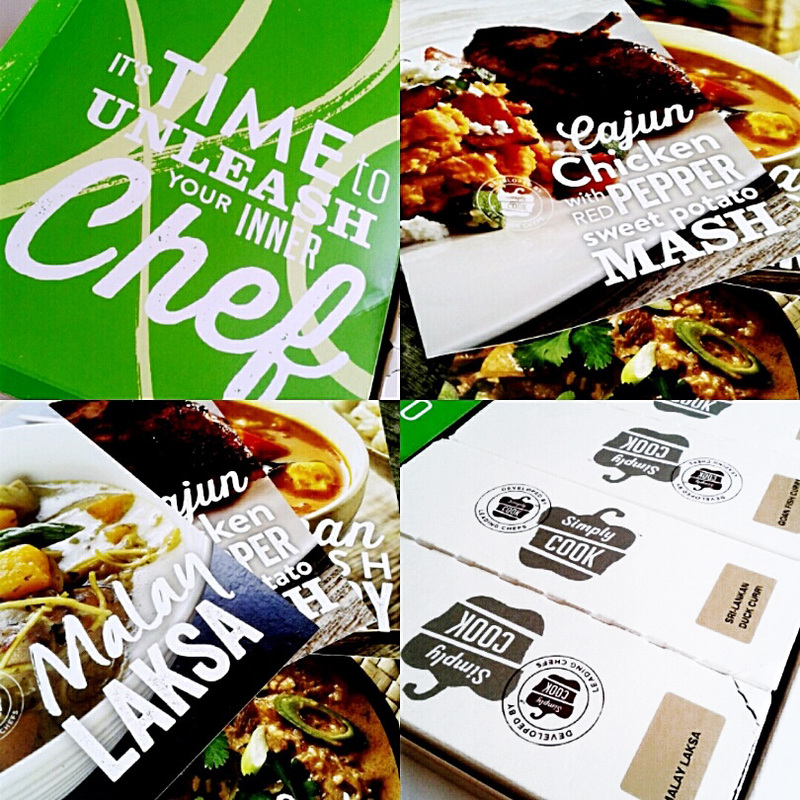 Well SimplyCook have come up with a new concept for a monthly subscription service which provides a box of 4 recipe kits which will have you cooking up splendid dishes from around the world in around 20 minutes. All the ingredients are natural, being hand picked and blended by their chefs. 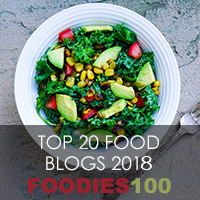 SimplyCook invited me to try out the service for myself and after perusing all 50 of their delicious looking recipes on-line, I was very much looking forward to my delivery. Unlike other recipe kits, you provide the main ingredients and the kit contains 3 pots that provide all the flavours and spices needed. The contents of 1 SimplyCook box with 4 recipe kits. 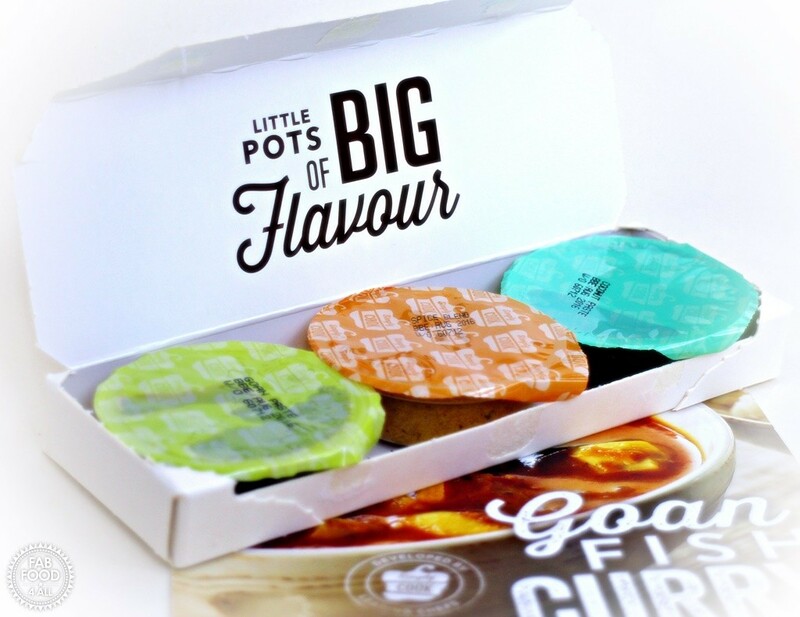 I have a particular penchant for fish curry so was very pleased to find the Goan Fish Curry kit in my box (once your subscription gets going you can choose your kits after your initial box choice). The other recipe kits I received were: Cajun Chicken with Red Pepper Sweet Potato Mash, Malay Laksa and Sri Lankan Duck Curry which all sound delicious. I think we often need a push to cook with ingredients we don’t usually buy so for me the duck will make a nice change! 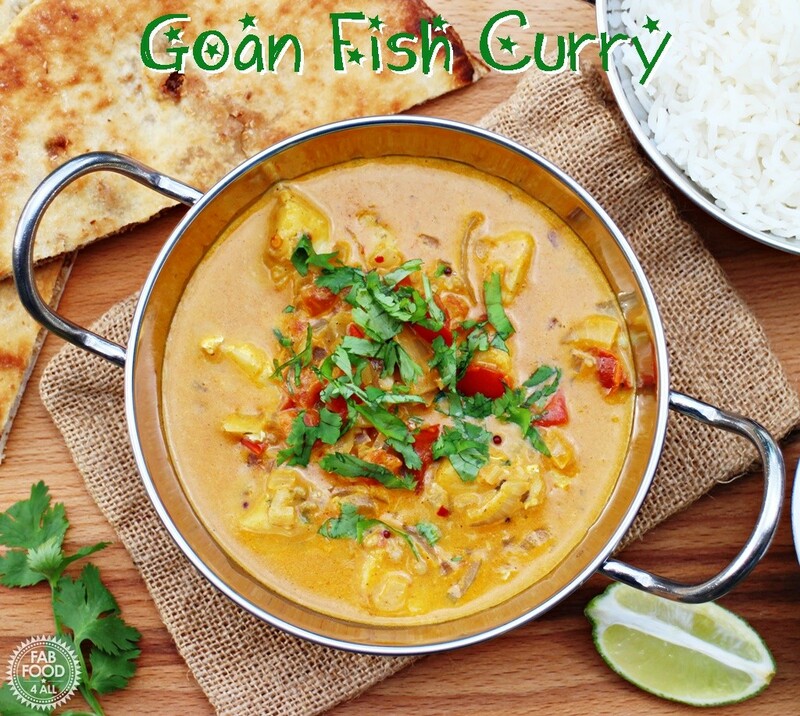 Goan Fish Curry recipe kit – one of 50 in the Simply Cook range. So back to the Goan Fish Curry which was so quick and simple to make it was almost like painting by numbers. I really believe that even a complete novice would achieve great results with these recipes. The SimplyCook recipe cards are very helpful as each one contains a handy hint, tells you what ingredients you need to buy, what you’ll need from your cupboard and there’s even a tear off shopping list at the top! 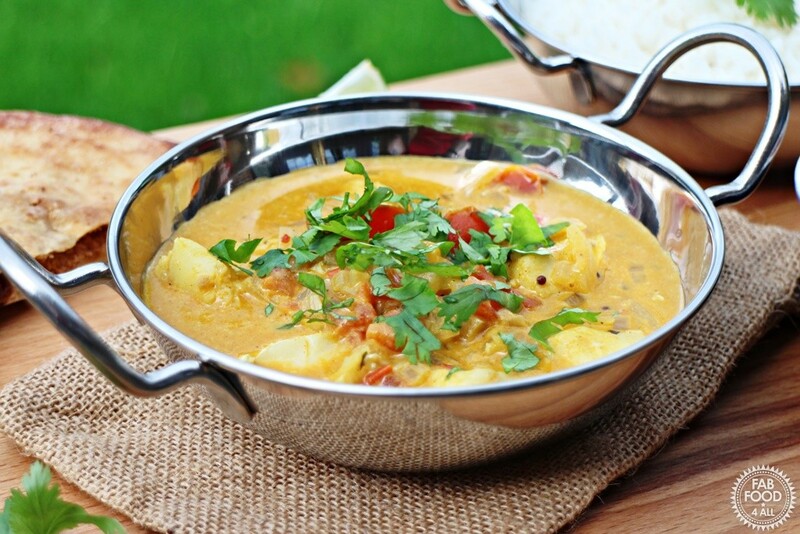 The Goan Fish Curry, as you will see from the recipe below, was completely fuss free and totally delicious. It could easily have served 3 or perhaps 4 if I’d added some more fish. The handy tip tor this recipe said I could also have used prawns or added butternut squash. The depths of flavour were just like those you’d get in a restaurant and I loved the crunch from the whole mustard seeds. Both hubby and I really enjoyed this curry! The box is delivered by post (within 2 days) so no waiting in for a courier, it just pops through your letter box. There are no fresh ingredients so no pressure on you to cook the recipes immediately or potential for food waste should unforeseen circumstances arise. You can buy ingredients at your leisure and benefit from special offers which is not an option with a full meal kit, so potential to save money. The kits are good value for money as you are getting quality spices and recipe cards which are beautifully packaged. There is no waste. How many times have you bought a jar of spice for a one off recipe and then never used it again? Even after a long day at work you’re not going to be too tired to make these recipes as they are so straightforward and quick. You can broaden you tastes by trying foods you might never have thought to eat before. 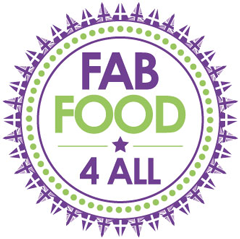 All the recipes on-line flag up known allergens. A subscription would make a really thoughtful gift. 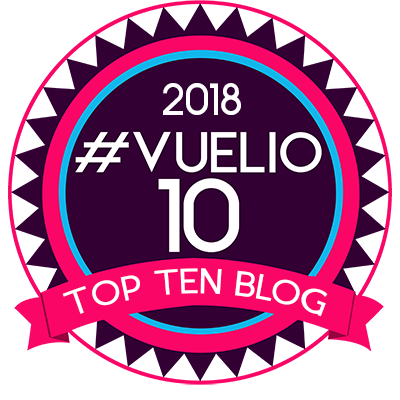 If you sign up do come back and let me know what you think! Heat 2 tbsps of oil in a deep pan at medium-high heat and add the onion, tomatoes and the Goan Paste. Stir for 2 – 3 minutes. Add the coconut milk and Coconut Paste to the pot and gently bring to the boil. Turn down the heat and simmer for about 5 – 7 minutes until the sauce has thickened slightly. Stir in the Spice Blend and then carefully add the fish and simmer for 5 minutes or until cooked through. When ready, spoon some rice into 2 bowls and ladle the Goan fish curry over the top. Garnish with coriander leaves and a squeeze of lime, if you're using them. 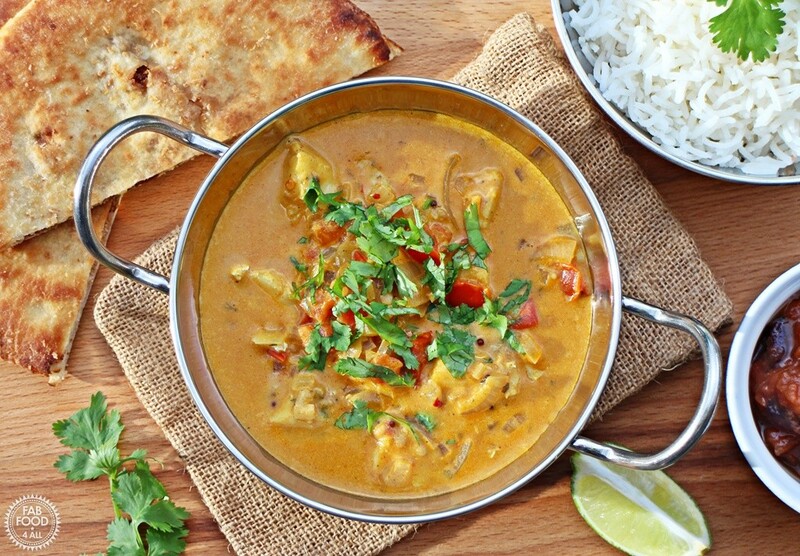 I would order this Goan Fish Curry in a restaurant! NB: This is a commissioned post and all opinions are my own. 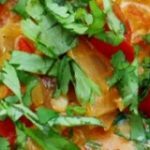 I’ve never tried fish curry – this looks so tasty! The end result looks fantastic, I must try this!